New UGallery artist Maria Stabio in front of her artwork. Minnesota-based impressionist Mickey Cunningham paints landscape and figurative artwork using loose brushwork and vibrant colors. She cites Pennsylvania Impressionists, especially Edward Redfield and Fern Coppedge, as her longtime inspirations. She explores adding experimental colors and abstract elements to her paintings. To ensure that viewers can interpret her figurative work in their own way, Mickey does not include overly specific or narrative details. South Carolina-based oil painter J. Michael Kennedy paints impressionist landscapes that capture the grandeur of the setting sun. From a young age, he has cultivated a deep fascination with color and drawing. After receiving a BFA in Graphic Design, he continued to study painting while working as a creative in advertising. Today, he focuses his attention on his oil paintings. For each piece, he begins by preparing his canvas with a thin wash of yellow ocher. Then, paints the layout and details with thick layers of paint, leaving the sky for last. Rather than depicting a specific location, his paintings are meant to convey moods from wonder and surprise, to solitude and peace. Maria Stabio is an artist based in Pennsylvania who creates acrylic paintings that depict objects from everyday life as brightly-colored, narrative compositions. She begins each work with color-block planes; then, she overlaps the shapes that create the many layers of her paintings. The array of translucent layers recalls light as it passes through stained-glass windows. She chooses to portray the objects from daily life, such as light bulbs, sandals, and leaves, that she encountered while visiting her family in the Philippines. These objects highlight the slight differences between life in America and life in the Philippines. Though Maria’s subject matter is based on personal experiences, she shows each object as a highly stylized, reduced iteration. She equates this process of abstraction to the transformation of an experience into memory. Linnie Brown is an artist based in Utah who creates mixed-media artworks using collage, paint, printmaking, and drawing. 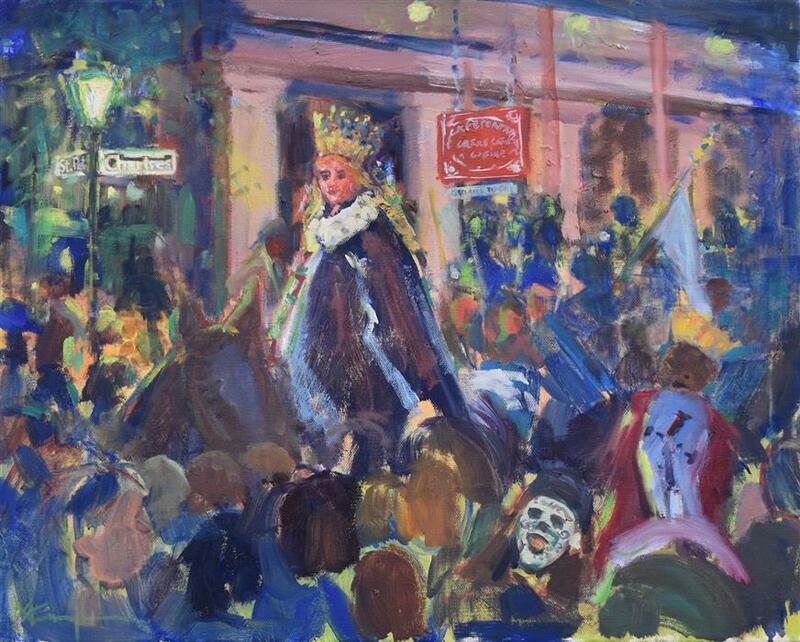 The significant places and locations from her life are a recurring theme throughout her portfolio. Linnie uses stencils that allude to significant places from her own life, including the floor plans of buildings and the boundaries of cities. She cuts these shapes out of paper for collage or traces them directly onto the panel or paper. She then builds the layers based on her intuition. To Linnie, every person is an accumulation of his or her past, and the memories of specific places such as former homes, schools, and cities, have a great influence on the way that person currently views and engages in life. Abstract artist Kurt Herrmann creates brightly colored, non-representational artwork from his mountainside studio in his home in Pennsylvania. His art is a celebration of color as a source of openness and freedom. He is inspired by the bright colors found in nature, such as the pink of sunburn or the yellow of a flower petals. Working in an abstract style, Kurt’s paintings do not attempt to promote specific messages, narratives, or agendas. Instead, they are simply meant to convey joy and energy through color. Bay Area artist Jeffrey Tover is an abstract painter who creates colorful, multilayered, and gestural artwork. The marks in his paintings are applied haphazardly and offer intrigue throughout every inch of the canvas. His paintings share similar gestural qualities paintings by famous Expressionist artists such as Cy Twombly, Joan Mitchell and Willem de Kooning. Jeffrey is interested in achieving uniqueness in each piece; every painting takes on its own individual persona and elicits a different response from every viewer. Illinois-based photographer and digital artist, Mark Hersch expresses his lifelong passion for photography, history, and architecture through his portfolio. He combines rare, historical images and contemporary images of major American cities. Mark begins his work by researching archived photographs. Then, he travels to the location to take his own modern image from the same vantage point. Finally, he uses his computer to conflate the images. His work is inherently nostalgic and is meant to elicit a powerful and personal response in every viewer. 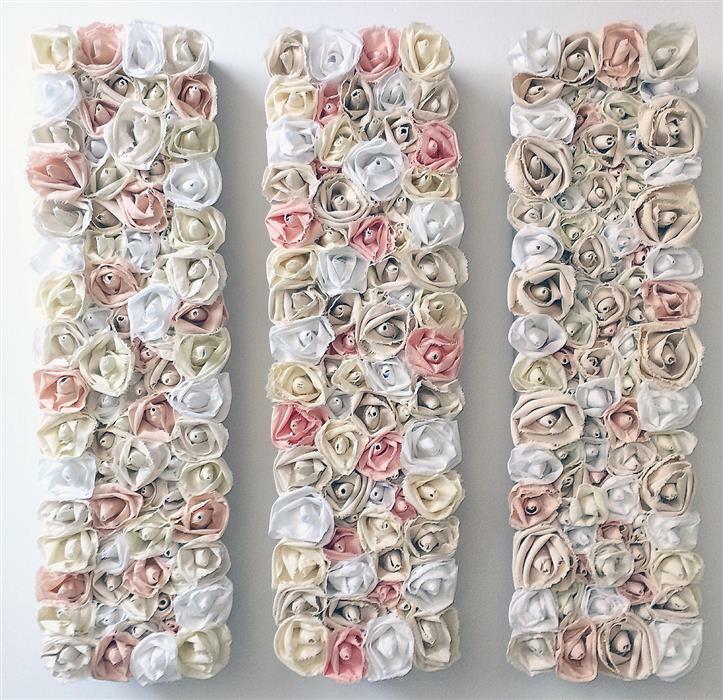 Phoenix, Arizona sculptor Andrea Cook’s wall sculptures of tightly bundled flowers are inspired by the elegance and loveliness of roses. Each rose is created from painted, hand dyed, or pure fabrics made from cotton blends, burlap, canvas, and muslin. She begins her process by tearing the fabric into strips and dipping them in a high-quality, light-fast archival glue. Then, she sculpts each ribbon into a rose shape and affixes them to a deep cradled birch panel or a gallery wrapped canvas. The final product is a tactile sculpture. “Everyone wants to touch the pieces,” she says. Though they appear to be soft, the flowers are hard and durable. United States Army veteran, Gregory Fricker, is a multi-media artist whose artwork explores the neuroscience of storing traumatic memories. Gregory explains that traumatic memories are not stored as narratives but rather as a collection of fragmented sensory information. He began creating art as a hobby and outlet for coping with a particularly challenging deployment. After retiring from the army, he and his family settled in Michigan where he graduated with a BFA in studio art. Encouraged by his friends, teachers, and mentors, Gregory began to see himself as a professional artist. The objects rendered in his artwork are symbolic of his own trauma. He uses “proxy” objects rather than specific depictions of his memories. This creates an emotional buffer against the trauma for Gregory. And, opens the compositions up for interpretation for his viewers. Martha McCowin is a mixed-media artist based in Utah whose abstract artwork gives visual form to complex human emotions. She experiments with mediums and the different layers of her compositions. Her process for each piece is intuitive and done layer by layer. Before starting a new layer, Martha observes the interactions of her materials on the surface. In that way, her work is a metaphor for life; it combines the deliberate with the unintentional. In addition to her career as an abstract artist, Martha is a graphic designer, portrait artist, and muralist.